The High Priestess represents the access to your spiritual enlightenment and inner illumination. The High Priestess has an evolved inner knowing that is associated with feminine powers such as intuition, serenity and psychic awareness. She draws on the secrets and unspoken wisdom in the universe. She understands the mysteries of this world as well as beyond. The High Priestess represents the highest moral standard, which stands above the manmade law. You connect to the High Priestess through your high self by engaging your intuition, meditation, dreams. 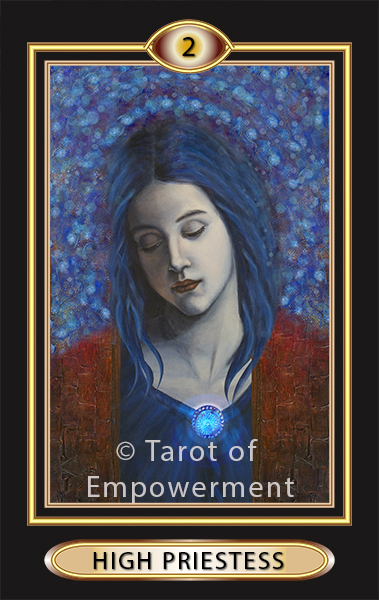 In Tarot of Empowerment the High Priestess is serene as she naturally draws on her intuition to contemplate the True Law of the universe. Her broach alights, mirroring the heart fire that represents genuine wisdom. Her wisdom engages the intellect as well as intuition. The High Priestess reflects the majesty of the ultimate feminine power. Upright: When the High Priestess comes up in your reading it suggests that you call on the wisdom of your intuitive powers. Look within to reveal what is hidden in the shadows, and then trust your instincts about the situation. This is the time to put your rational mind aside and rely, without question, on your intuitive understanding of the issue. Empowerment: You are empowered as the High Priestess when you sit in the listen to the internal wisdom, listening and trusting your inner voice. Reversed: You are likely using your rational mind to argue with yourself about a situation or you are in denial about what you intuitively know to be true. Pause, go into silence and let the answer come to you without argument.